It is a mystery why we have no evidence of any leather armour from antiquity - barring some cavalry thigh defences from Roman times. This mystery needs some work but probably has a rational explanation. Such as, there never was any. It is also a mystery as to why reenactors insist on producing and wearing a wide range of leather armours without any historical prototypes within the period of interest. We have no evidence for horn and bone armour from Viking times but it was possible to make it then. Why do people not make it for reenactment? Why not wooden armour ? Something is amiss here. Thigh defences for a cataphract cavalryman. NOT Viking. There is NO evidence for leather armour in the Viking Age or historical periods immediately before or after. There is ONE find of thigh defences for cavalry made of laced rawhide lamellae from the Roman finds at Dura Europos dating to the third century AD. It is sometimes stated that lamellar armour was sometimes made of leather. There is no evidence for this. Lamellar armour was usually bound with leather and the plates edged with leather but the plates themselves were of iron. There is ONE anachronistic reference to leather armour which may be a later interpolation. Sucess of Harald Godwineson's invasion of Wales in 1063AD attributed to armour of rawhide bands and all heavy equipment left behind. The account was written 100 years later. There exists no other reference to leather armour in the same time frame. There is ONE reference in a medieval saga to magical armour of reindeer hide. From St Olaf's saga. Anyone who would like to use this reference must do some interpretative gymnastics to explain how the effectiveness of this armour is actually attributed to magic spells cast by a Saami shaman on the garments but it really refers to actual leather armour? Suddenly the shine comes off this leather armour. Reindeer, Saami, magic. Not Viking. Not historical. There are numerous groundless illustrations in popular books. Osprey's colourful plates are, as often, the source of mythical evidence. No evidence for the quilted leather armour shown here in Osprey Elite 3 'The Vikings'. 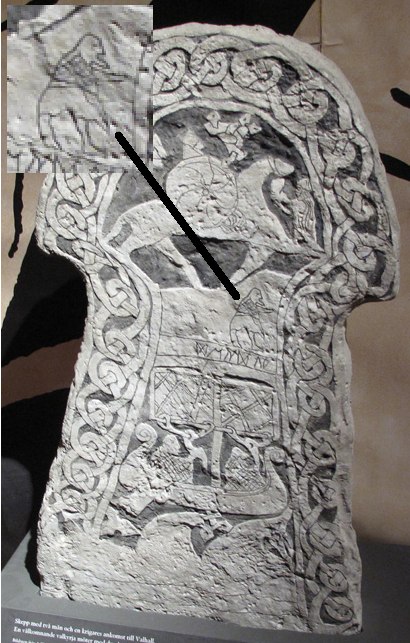 There is ONE figure on a Gotland picture stone which has a hatched ornament. This could be interpreted as quilted leather armour. But only if one goes against the weight of probability presented by the fact that the only armour represented in Viking Age epigraphic evidence is mail. In addition, there is a slight drawback when one looks further down the stone and sees the artist has used the same ornament for the cloaks of two figures sailing a ship. Padded leather armour cloaks, in a ship ? 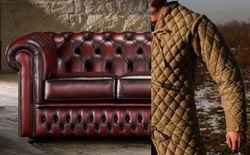 Mail or quilted leather ? 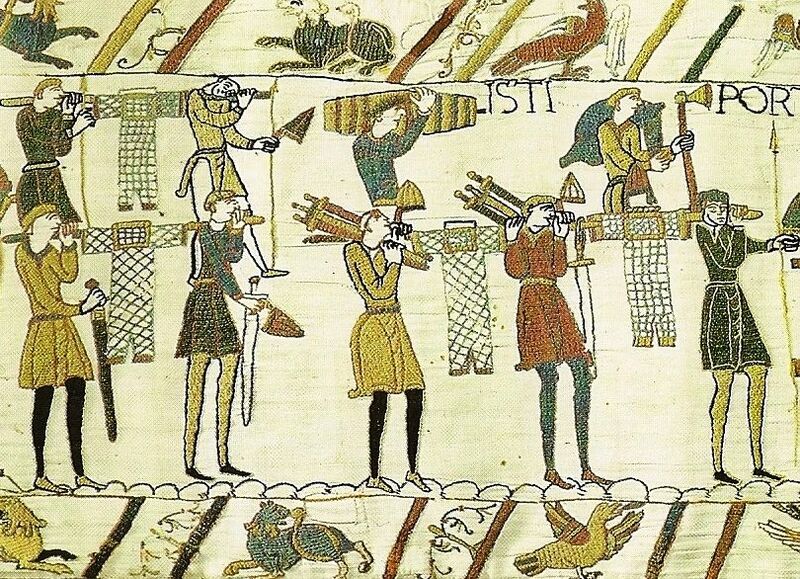 If one would insist on interpreting the Gotland image as leather quilted armour then one must also apply the same interpretation to the hauberks shown on the Bayeux tapestry. Leather armour cannot stop a thrust from a spear. It cannot stop anything approaching a good stroke from a sword. It cannot stop an arrow. Leather armour is not known in the Middle Ages. Armours based on fixing small plates and studs together uses textile as the basis, not leather. Leather was available in great quantity in the Middle Ages. No leather armour is known apart from, maybe, some limb defences of 'cour bouilli' and maybe some helmets which do not survive. The Roman armour expert Mike Bishop discounts the use of leather armour by the army that conquered and held the empire. See video below where 6mm plates of cuir bouilli are penetrated by longbows. No man could wear armour made of leather this thick. Leather armour less tough would be easily defeated. Leather armour is stiff and extremely hot to wear. It does not absorb sweat. It does not breathe. In the summer campaigning season it would be insufferable to wear for any length of time. Mail is more flexible, ventilates and allows sweat to evaporate. Leather armour would be expensive if it was made of good quality materials and was to have the appearance desired by a man of the military class. If leather armour is subject to damp and mould it will smell, discolour and fall to pieces. If leather armour is worn a lot it stinks of old sweat, moulding leather and fat. There is NO evidence for leather armour in the Viking Age and it is unlikely it was ever used.